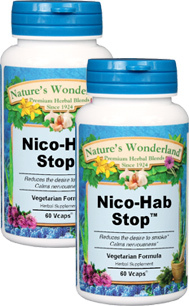 Nico-Hab Stop™ - 450 mg, 60 Vcaps™ each (Nature's Wonderland) - Penn Herb Co. Ltd. Quitting the tobacco habit is one of the best decisions you can make for a healthier future. Nico-Hab Stop is a blend of herbs that tends to decrease the desire to smoke, makes the taste of tobacco undesirable, and quiets frazzled nerves. LOBELIA…provides targeted triple support - makes the taste of tobacco and nicotine undesirable, acts as a powerful herbal relaxant and supports bronchial and respiratory health. MAGNOLIA BARK, SCULLCAP, PEPPERMINT…calming herbs soothe nervous irritability, restlessness and tension. QUASSIA…liver cleanser that also decreases desire for nicotine.